While there is no such thing as an invincible floor, the floors created by Barefoot Surfaces are as close as you can come. Typically, floors in industrial spaces and work areas are made from concrete. You can go to any mechanic shop and see the concrete floors and the oil stains and wear on those floors. An exception is the flooring created by Barefoot Surfaces. Many floor coating companies simply do a single protective coat and that is the entirety of their floor treatment. 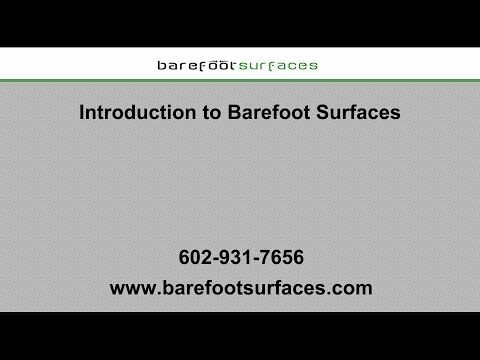 At Barefoot Surfaces, we use a polyaspartic primer, base coat and sealer to create multiple layers of protection over your concrete. This makes for a floor that is easy to clean, and does not stain. This means your floors can take a beating, from mechanic work to moving heavy equipment and power tools, and simply be recoated after a few decades. is by nature porous, and the quality of the concrete can vary widely from one mix to the next, dependent upon multiple factors, from the formulation to the application and pour. By coating your concrete, you are creating a space in your home or business that can endure through rough treatment, oil spills and extreme heat, rough and heavy contact from weights dropping to moving gun safes, and be protected. Our multiple layers are industrial grade protection for your floor. There is also maintenance to consider. In order to clean concrete, many times it needs to be surfaced and prepped using industrial strength equipment, no easy task. With Scottsdale garage floor coatings by Barefoot Surfaces, you are able to restore them to their original perfect condition with nothing more than a bucket and a mop, as our process thoroughly protect those pores and creates a hydrophilic layer that is easily cleaned. No longer will you need to worry about what you park in your garage, or whether a grease or chemical spill will forever stain your floor. With our floors, you are as close to invincible as you can get.